Some criticisms are valid, and this extends to the domain name industry. 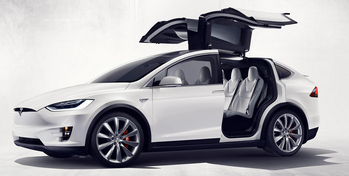 I stayed up to watch the Tesla Model X launch event online Tuesday night. It was supposed to start at 8 PM PST. Nearly an hour later, Elon Musk shuffled onto the stage unapologetically and proceeded to give a lackluster introduction to a car his company is depending on for its future. It has been amusing to see how people reacted to this. Most amusing are the Tesla apologists who make excuses for the company whenever someone comments about the tardiness and lackluster presentation. The presentation started an hour late? Yeah, and I’m sure the three thousand people in attendance (and many more online) don’t consider their time valuable. The event wasn’t run very professionally? I might need to update my definition of a small company. Last I checked, companies with $3.7 billion in revenue and a market cap of $32 billion didn’t qualify. Why did it seem like Elon hadn’t rehearsed enough, and shouldn’t they have brought someone else on stage with him that can deliver a decent presentation? Sheesh. I bet if Elon slapped a kid up on stage (he didn’t! ), someone would come to his defense and say it’s part of his plan to change the world for the better. Look, Tesla makes incredible cars, and I love the Model S. But neither the car or the company are perfect. I see this in the domain name industry as well. People are black and white on topics, and will never admit that arguments or criticisms against something they love might be valid. New TLDs or .Com? It’s one thing to think .com is king and will always be so, or to take the opposite viewpoint that .com is stale and new TLDs offer better naming possibilities. You can make arguments for both, and you should be willing to consider these arguments. I also see this when it comes to companies (and sometimes people). Some people think a company can do no good or can do no harm. They are blinded (at least in their public comments) that companies have strengths and weaknesses. Another example is saying that someone “just doesn’t get it” when they don’t agree with you or buy what you’re selling. I recall someone trying to sell a domain name for over $1 million. They publicly discussed how they explained all the benefits to a number of potential buyers and they all declined at the price. His response (and some commenters) to the rejection: “These guys just don’t get it!”. I guess he never stopped to consider that perhaps he a) didn’t explain the value proposition well or b) the domain name wasn’t worth $1 million. A lot of times, peoples’ vested interests make them say silly things. I certainly hope they don’t actually think these silly things. Don’t be like a Tesla apologist who will never openly discuss the company’s issues. Be open minded, and consider that no one and nothing is perfect. Tesla batteries come with an 8 year warranty. Good post… essentially about marketing. Some people/companies think their product(s) is so wonderful that they can just throw it out there without any polish or professionalism. Steve Jobs could have done the exact same thing… but chose to “package” his products with a superb, world-class presentation. I guess it just depends on the company mindset and culture. Tesla didn’t do a product launch… it was a press release. There’s an art to selling ideas that very few people do well. I’ve seen Musk’s presentations before… he’s brilliant, but he’s a horrible presenter. The only reason his launches have been successful was that the products eventually proved to be better than the presentation. When a product or service is more subjective, such as a domain it’s nearly impossible to get somebody to “get it”, especially since a domain’s true potential goes far beyond what keywords it contains, or the TLD. With a domain, it also has to “feel” good to consumers. Getting consumers to feel good about the value of left side of the domain is hard enough, convincing them to trust something new on the right is going to take a while. As hard as that may be, if there was a guy with Steve Jobs’s personality selling that idea, everything could change. The trouble is, I don’t think anyone has that kind of influence or personality. The reason is simple. Steve Jobs actually believed every word he said and he wanted everyone to see what he saw. I think a lot of the people backing the new TLDs are half committed. It’s more of a hedge to them so all their efforts to sell the concept are just marketing hype. They just say what they think people want to hear. Most of what I’ve seen to promote nTLDs is nonsense, and people don’t believe it. XYZ’s strategy is that .COMs are old school, comparing them to a car from the 90s. Does anyone believe that? Another bad one… Saying we’re running out of .Coms. Really? Then there’s my favorite… Selling .Com owners on the idea of buying the same name with dozens of other TLDs to “protect your identity”. Against what? What a ridiculous design. Pay over 100 grand for a car and the one who drives it doesn’t get to open the cool doors? Seriously? When or if you ever have passengers that’s the only time the doors get used. Stupid!! I just waited until yesterday to watch the launch video. The presentation was well received by the public. This isn’t specific to just Tesla, EV advocates do it for all electric vehicle companies. Holding 1 strong opinion feels very satisfying. Little thought required for upkeep. Loosely holding on to several conflicting viewpoints at once can feel precarious. Juggling requires practice and attention. Nearly all simplistic viewpoints will be false; but if you subscribe to one, then you’ll be protected by group membership. Hold any complex viewpoint, and you’ll be attacked and misunderstood by groups at both extremes. Both the education system and the mass media (which is what “educates” citizens during the decades after we’re officially “educated”) neglect to teach us how to question our own positions and disagree constructively. That deficiency shows up everywhere in society – not least within the domain industry. Great post. The other annoying thing about Musk is always hearing how brilliant he is and how he is the next Jobs or Edison or whatever. Pick the accolades. I listened to some of the event. The “whoops” were ridiculous. I kind of question how many of the people sitting in the audience can afford to buy that car. Something like 20,000 people put down deposits before seeing pricing or even the final car.